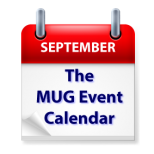 It has been a long time since such a star-studded week appeared on The MUG Event Calendar. Bob “Dr. Mac” LeVitus will make two appearances this week, one in Oregon, the other in Michigan. Adam Engst of TidBITS will review Apple’s new products at a New York group, and Jeff Gamet of The Mac Observer will discuss home automation with a Texas group. Joe Kissell of Take Control Books will talk about issues of digital legacy with an Alaskan group, and Chuck Joiner of MacVoices will outline things Apple does right with a New Jersey group. Other topics on the roster for the week include podcasts, backups, programming, and identity theft. Oh yes…and there is a little event hosted by Apple this week too. Princeton Macintosh Users Group – Chuck Joiner on "What Apple is doing right (and wrong)"
South Suburban Macintosh Users Group – The Equifax Data Breach, What to Do to Protect Yourself?